Ms. Dearie rocks a Verve record cover like no other. 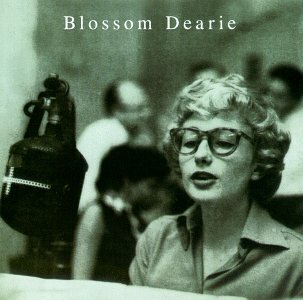 One of my long-standing favorite sounds, let alone singers, Blossom Dearie passed away at her home in New York City on February 7, 2009, at the age of 82. She defined artistry and singular vision with her voice that sounds like no other. Described as distinctive, unique, child-like, innocent (though lyrics like “I’m an evil, evil woman, but I want to do a man some good” prove that adjective false), and heart-felt, it is impossible to describe her sound or her appeal across generations or genres. She played out regularly until 2006, with critics and reviews saying that her voice and performances were undiminished by her age. Anyone who grew up watching Saturday morning television in the 1970s through the mid 1980s in the US will instantly know her by the song titles: “Unpack Your Adjectives”, “Mother Necessity” and the hauntingly beautiful: “Figure Eight” from the kickass Schoolhouse Rock series of animated educational films. Most of the original music for the Schoolhouse Rock shorts were composed & also performed by Dearie’s friend Bob Dorough, whose voice is as familiar & recognizable as the perfect male reflection of Blossom Dearie’s own style and phrasing. Sweet without ever being sacharine, everyone could use a little Blossom Dearie in their lives. A very nice and descriptive discography is here. This entry was posted in News & Events, Stuff I Like and tagged awesome, blossom dearie, bob dorough, female vocalist, jazz, schoolhouse rock, singer by strawberryluna. Bookmark the permalink.